Here we're going to look at the problem of decelerating on your longer chip shots, the problems that's going to cause and how to correct it. So if you decelerating on your longer chipping basically what's happening from your start position, the clubs moving away and then you're slowing the club down into the ball. So you're slowing the club down into the ball, ask the club slowing down and the club head slowing down into the ball, gravity is going to play a part in that too make the club connects with the flow before you connect with the ball. So you're going to hit the ground and then hit the ball if you're slowing the club down, makes it very difficult to get a consistent connection with the ball and it also makes it very difficult to control the distance because if you're slowing the club down, you're not really sure what speed you're going to hit at. It's going to vary. So rather than decelerating we need to get you to accelerate through the shot or maintain that club head speed as you go through. So here's a few good tips to help you do that. You're decelerating on your chip shot. You'll find that you'll swing back further than you'll follow through because the club slowing down and stopping as its hitting the ball. 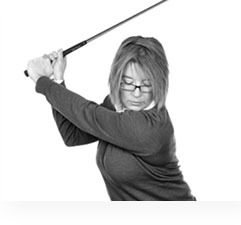 So you want to work to improve this on what however thought you move the club head away from the ball on your back swing, move the club back to the ball and then equal the same distance if not a tiny bit more as you move through the shot. So work on having an equal length. Get the back swing position to mirror the finish position and that will ensure that you're keeping the speed going through the swing and that you're not decelerating as you hit. Another good way to help you to make sure you're not decelerating is working on your tempo would be to count. So as you swing in back as you start the movement back, say the number one. So you're going one, two, three maybe up to this waist high position so it's taking you a count of three to get to waist high and then hit on the number four. So this will ensure that the clubs moving more quickly as you're going back down towards the ball which will then keep the club head speed going and you'll finish in a more full follow through, in a more myriad follow through position. So let's have a go doing that. We're going to work on swinging the club back to waist high so we're hitting a longer chip so we must make sure the club goes through to waist high and the follow through. And I'm going to count to myself as I do that one, two, three and then four on the hit. If I'm only taking one number to swing from waist high back down to the ball, but I've taken three numbers to go from the ball to waist high, I must be accelerating. So back to waist high, going one, two, three, four okay and that's going to let us hit a really nice, crisp chip shots and stop you decelerating through the shots as you're hitting.